Goodbye winter, hello outdoor patio. With warmer weather on the horizon, we're looking forward to spending more time enjoying our beautiful outdoor spaces. Luxury outdoor rooms can be customized as you want to fit your needs and design preferences. 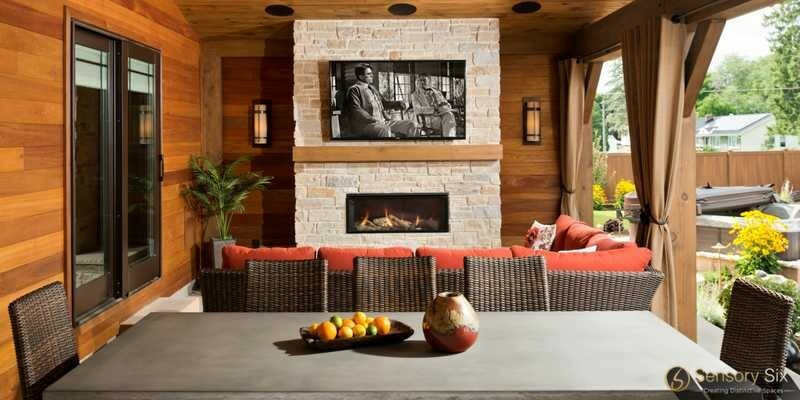 There are many design elements you can incorporate into your outdoor living space to make it as beautiful, functional and comfortable as the inside of your home. Here at Sensory Six, we love to design outdoor living spaces for our clients to enjoy all Summer long (Spring and Fall too)! 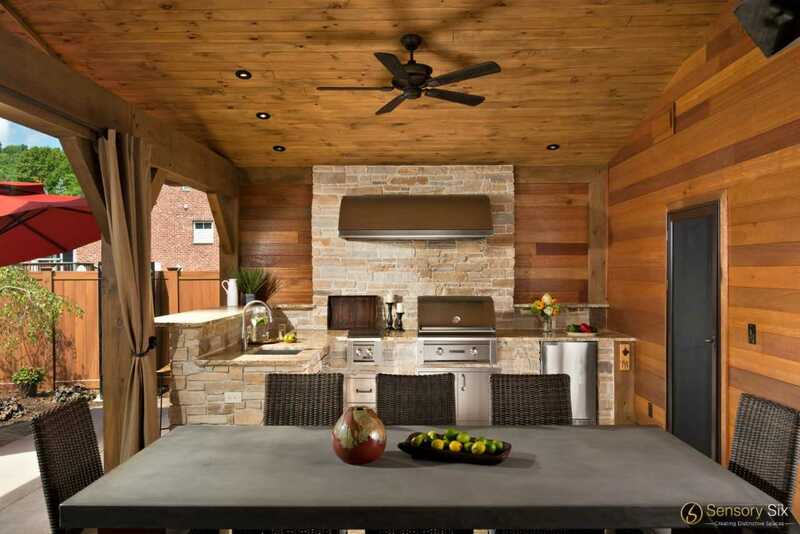 You can turn your backyard into the ultimate at-home resort, which has almost everything a homeowner could ask for in an outdoor room: outdoor kitchen, seating areas, outdoor fireplaces, a pool and spa. 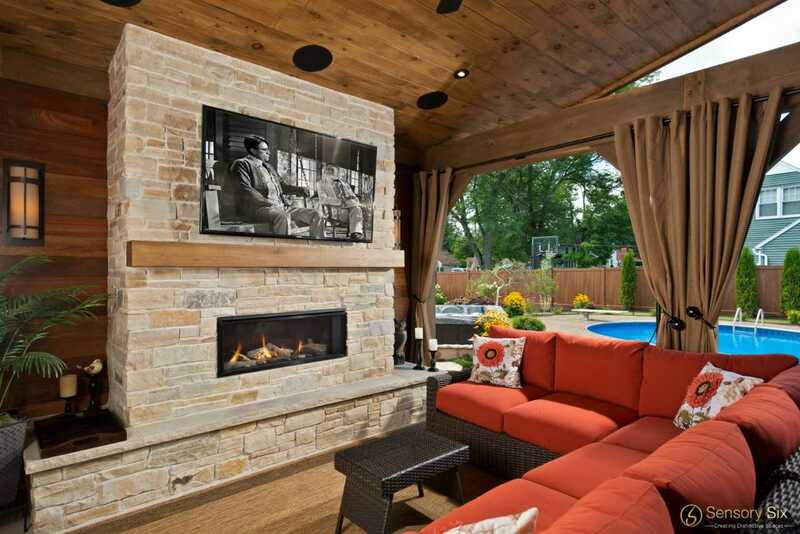 Making an outdoor space flexible to support all forms of entertaining is important: Maybe the husband will want to watch the game with his friends, the wife will want to enjoy a nice meal in an outdoor dining space, or perhaps they both want to enjoy a good movie with the fireplace roaring. Typically, homeowners want the luxury to be able to do all these activities in one general area. At Sensory Six we love being given the opprotunity to translate your vision into reality, creating a space that is perfect for you in both form and function. A good outdoor layout offers many options to relax, socialize, and entertain. When considering an outdoor space, create a list of what’s most important to you; like a pool, spa, fireplace, kitchen, etc. When selecting amenities for your outdoor room, choose those that will best service your purposes and maximize your space and budget. If you are someone who is interested in a large outdoor space, it’s important to establish separate areas while still maintaining a unified look to the backyard. We believe your outdoor space should be your haven, both calming and serene. As homeowners continue to embrace the outdoor lifestyle, luxury outdoor rooms are becoming a popular request. At Sensory Six, we would love to work with you to build and design your dream outdoor space! We understand everyone’s need for having a space of their own that has an emphasis on functionality, aesthetics and overall wellness. Interested in making your outdoor living space to functional and enjoyable? Call us at (518) 306-1099 to set up a time to meet so we can help you create a space unique to your wants and needs.